The Holy Hand Grenade of Antioch draft-camelot-holy-grenade-00 Abstract The menagerie of beasts and artefacts depicted in RFC8140 may be usefully supplemented by other renowned figures of Internet and more general lore. This document extends the menagerie to the seminal fable of the "Holy Hand Grenade of Antioch", as depicted in the Monty Python film "Monty Python and the Holy Grail", as well as "Spamalot", the musical inspired by the movie. Spamalot The relevance of the musical "Spamalot" to Internet lore should be obvious to the reader; but in case of doubt, see also Section 1 ("What is Spam*?") of RFC2635. Status of This Memo This Internet-Draft is submitted in full conformance with the provisions of BCP 78 and BCP 79. Internet-Drafts are working documents of the Internet Engineering Task Force (IETF). Note that other groups may also distribute working documents as Internet-Drafts. The list of current Internet-Drafts is at https://datatracker.ietf.org/drafts/current/. Internet-Drafts are draft documents valid for a maximum of six months and may be updated, replaced, or obsoleted by other documents at any time. It is inappropriate to use Internet-Drafts as reference material or to cite them other than as "work in progress." This Internet-Draft will expire on September 24, 2018. Copyright Notice Copyright (c) 2018 IETF Trust and the persons identified as the document authors. All rights reserved. This document is subject to BCP 78 and the IETF Trust's Legal Provisions Relating to IETF Documents (https://trustee.ietf.org/license-info) in effect on the date of publication of this document. Please review these documents carefully, as they describe your rights and restrictions with respect to this document. Although the RFC Editor has recently dragged the IETF kicking and screaming into the twentieth century [RFC7990] [RFC7996], there is a yearning among all right-thinking Internet architects to "keep it simple" and to return to the olden days when pigs could be given thrust without anyone taking undue offence. While no pigs, flying or otherwise, are involved in the transition to RFC XML v3, it is opportune to enhance the [RFC8140] legendarium in the service of RFC XML v3, by illustrating its functionality through references to the mythology of Camelot, and particularly the incidents at the Cave of Caerbannog. In their siege of the French-occupied castle which may already contain an instance of the Grail, Sir Bedevere the Wise proposes to use a Trojan Rabbit to infiltrate the castle, with a raiding party to take the French "not only by surprise, but totally unarmed." The proposal, unsurprisingly, proved abortive. The more so as the raiding party forgot to hide within the Trojan Rabbit, before the French soldiers took the Trojan Rabbit inside the castle. Guarding the entrance to the Cave of Caerbannog; see Section 4. Less overall screen-time dedicated to the Trojan Rabbit. The Trojan Rabbit as projectile has already been anticipated by the Cow as projectile. The exchange of projectile animals was the beginning of a long-running fruitful relationship between the British and the French peoples, which arguably predates the traditional English enmity with the French. The Killer Rabbit of Caerbannog, that most formidable foe of the Knights and of all that is holy or carrot-like, has been depicted diversely in lay and in song. We venture to say, contra the claim made in Section 4.1 of Ze Vompyre, that the Killer Rabbit of Caerbannog truly is the most afeared of all the creatures. Short of sanctified ordnance such as Holy Hand Grenade of Antioch, there are few remedies known against its awful lapine powers. 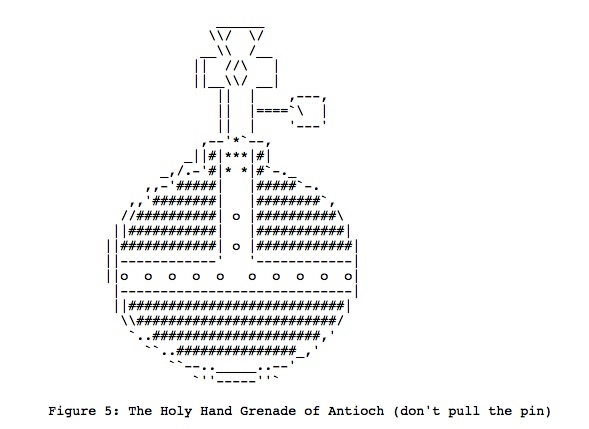 The solution to the impasse at the Cave of Caerbannog was provided by the successful deployment of the Holy Hand Grenade of Antioch (see Figure 5) . Any similarity between the Holy Hand Grenade of Antioch and the mythical Holy Spear of Antioch is purely intentional; any similarity between the Holy Hand Grenade of Antioch and the Sovereign's Orb of the United Kingdom (see Figure 6) is putatively fortuitous. Ordnance deployed by Brother Maynard under the incantation of a lector, in order to dispense with the Foes of the Virtuous. See Figure 5. A supposed relic of the crucifixion of Jesus Christ, this is one of at least four claimed instances of the lance that pierced Christ's side. Its historical significance lies in inspiring crusaders to continue their siege of Antioch in 1098. Part of the Crown Jewels of the United Kingdom, the Sovereign's Orb is a hollow gold sphere set with jewels and topped with a cross. It was made for Charles II in 1661. See Figure 6. "Here may be found the last words of Joseph of Arimathea. He who is valiant and pure of spirit may find the Holy Grail in the castle of — Aaaargh." IANA might consider a registry to track the mythical, especially ravaging beasts, such as the Killer Rabbit, who haunt the Internet. Do not let the Killer Rabbit out under any circumstance. I repeat. Do not let the Killer Rabbit (Figure 3) out.